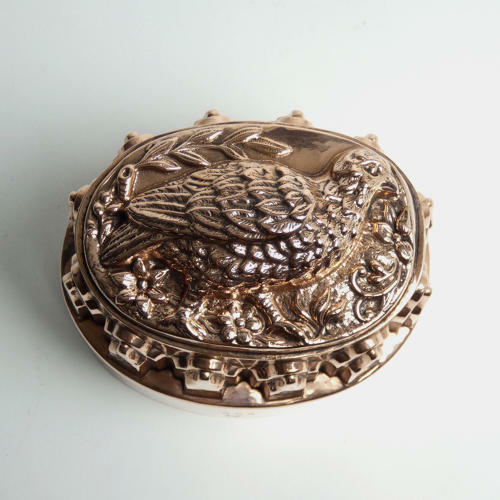 A fine quality French copper mould with a game bird to the top. This mould is marked, to the side, with an engraved cockerel, beneath the number ‘373’. The cockerel is the trade mark of the company Letang, ‘373' is the pattern number and the mould dates from c.1870. The design to the top of the mould depicts a game bird, possibly a partridge, surrounded by flowers and foliage. It is exceptionally finely modelled, with fabulous detail, and it is made from a substantial gauge of copper. The piece is in excellent condition. The tinning, to the interior, is slightly worn and there is a tiny hole in the rim where a hanging loop has possibly been removed.